Growing up this was my favorite picture of me and my dad! Can you see him? It was my proof that he really existed. I’ve shared in previous posts about My Story of Grace that I grew up without a father. The picture above is how I always knew my dad. He was nothing more than a remnant of a picture that had been cut by a girl (my mom) who knew no other way of dealing with the pain of being left alone with a baby at 18 years old. He left before I can remember and I never heard from him again until I was twelve, when he burst into my life with the promise that I would finally be like everyone else and no longer an illegitimate mistake. I was excited by the possibility of having the kind of dad who could protect me from all the evil that had touched my life. But those dreams quickly faded as I had my hopes crushed once again when he chose to leave without any kind of explanation within days of arriving. I never really understood why he left, and I assumed it was out of cowardice. My mom said he told her he had to leave because we would be better without him. I just couldn’t get past my own hurt to understand that he had been broken and hurt too. To get past that pain that this kind of abandonment leaves on a child, I decided in my own heart that I would abandon him this time instead. The song “Hit The Road Jack” became the anthem of my childhood and somehow it really did seem to dull the pain. I couldn’t deal with the rejection I was feeling and so I turned my pain into hatred, and bitterness took hold of me and twisted it’s roots all around my heart until they became one. I believed the lies that I didn’t need a dad and I was better off without him. I was getting along fine in life with my own family. My kids had a dad who was very present, the exact opposite of the one I had. Then a couple years ago, out of the blue my mom told me she talked to him and he wanted to talk to all of us. My immediate reaction was that I didn’t care. Too bad for him! Finally the day I had waited for all my life was here. I could reject him and let him see how it felt to be on that side of things. So I didn’t call the number on the piece of paper (although I couldn’t bring myself to throw away the only connection I had to him). But something in my heart that was hiding under the twisted roots began to come alive. After several months I decided I wanted to know why he left, and I wanted to offer him forgiveness because I knew it was the only way I could heal. What I really wanted was to know why I wasn’t good enough for his love. So I called him with trembling fingers. And I braced myself for another blow of rejection. To say the call was strange is an understatement. I mean here I was listening to a stranger share his heart with me. He kept wanting to make excuses for being gone, and I let him because as he was talking all I could hear was the same voice of rejection and hurt and abandonment that resonated in my head my whole life. He and I were really much more alike than just the brown hair & eyes we shared. He shared a few stories of his childhood with me that made me tear up. He told me stories about my grandma (his mom) that gave me glimpses of the kind of pain and hurt he grew up with. His life was MUCH worse than mine. As I let him talk, I realized how sad I felt for this little boy who lived a life of abuse by many, neglect was the constant theme of his childhood. And nowhere in any of his childhood stories did I sense there was anyone who loved him. I can imagine what if feels like to grow up feeling rejected and abandoned by those who are supposed to love you. But never could I imagine the damage caused by growing up without love. I always knew I was loved by my mom, which made things a little better. He didn’t get to feel this kind of love. He was taught to be the man he is. Today I realize that he wasn’t absent because he didn’t love me, he just didn’t have the ability to love me. He knew it when he left, and in some strange way I think it was the most selfless thing he could have done. You can’t give away something that you do not have. I am thankful that I was given the opportunity to talk with him and hear his stories, and tell him that I understood and forgave him for leaving. It doesn’t change the past, but I pray for him now that he will know the love of the Father just as I have and he will one day be able to forgive himself. If you are still dealing (or not dealing) with the hurt & pain that comes from being abandoned & rejected by your earthly father I want you to know that your heavenly Father has always loved you! I thought this was just going to be ‘one of those posts’. I couldn’t have been more wrong. My heart hurts for you (and him). My heart also rejoices knowing that you realize that love that you have from our Heavenly Father…..it doesn’t get ANY better than that. Blessings to you, my friend. Your post was beautiful. Thank you for sharing. I was nine months pregnant with my only child when my husband died in an accident. It was so hard. Blessings to your mother…not an easy road to travel. The minister read Psalm 68:5 @ his funeral. God got me through his death and my son’s birth exactly one month later. I am crying now reading the the message again because I vividly remember those comforting words. And now I am crying. Thank you for sharing this, I never know why God places what he does on my heart to share. Kristie–I swear you and I have had the exact same lives! My biological father also was not present in my childhood. My step-father adopted me and my brother when I was in 4th grade. 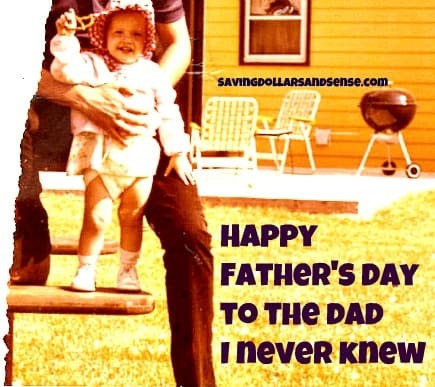 Even though I had the best dad ever growing up, my heart still ached because someone willingly gave me away. I couldn’t understand it. The day I came home from the hospital after having my daughter, my second child, I received a plant from him. Honestly, it infuriated me and I gave it away. I’ve since had contact with him, and let him know that I’ve forgiven him for everything in our past. There really isn’t a relationship there, but at least he knows that I love him and that I’ve forgiven him for everything. I was born in Romania but because the government was very unstable( We citizens of Romania got rid of our Communist President in 89 and I was born in 91)and my Romanian dad was out of a job , my parents put me in the government orphanage when I was born. I have always wondered what my dad thinks about what he did. Thankfully, God allowed good godly Christian people who wanted children but couldn’t have any more, to adopt me. They saved my life. I had a medical condition that I didn’t know about. My parents took me to a military doc who figured out what is was and now I am healed of it. I know now why God had a reason for me to be adopted. I accepted Christ as my Saviour 1 year after I was adopted. I was 7 when I got saved and when I was 12, God called me back to Romania. I am so thankful that God saved me physically and spiritually. What an incredible testimony of the healing power of forgiveness. Thank you SO very much for being willing to show others what they are capable of us well. Hearing such a story of healing is an encouragement for me to continue to love those that are difficult and your story is a true inspiration. Very touching! Were you able to have a relationship after the phone call? Unfortunately we haven’t spoken since, but it was enough for me and the forgiveness I gave him allowed God to do a deeper healing in me. Maybe one day we’ll speak again, but it’s not necessarily a healthy relationship for me. Wonderful. Being an adopted child, I can relate to this all too well. Wonderfully written! Beautiful post. My father disappeared throughout my life on drinking binges. He was a mess until he died 6 months before I got married, almost 20 years ago. It saddens me that his life was so sad. He, too, grew up in an emotionally abusive family. I didn’t know them well, but they were sooo dysfunctional. I am so blessed to have a wonderful husband. And fortunately, I have (almost) always had a great relationship with my Heavenly Father, so He has been the Dad I would have missed out on otherwise! Thanks for sharing your heart! I understand! I wish you both peace! Not having a father forced me to find the very best father I’ve ever met for my daughters. I may have (and still do) suffered from rejection. But my daughters will never know that feeling, thank God! I have tears in my eyes as I read your post. My son is growing up without his dad. My heart breaks whenever he asks why his dad doesn’t see him. I hope one day his dad will have a change of heart and reach out to him. Thanks for sharing your story. Amazing story of grace and mercy – just like the Lord gives to us. Thank you so much for sharing this!! Thanks for sharing. I know this post will help many that are struggling with this same issue. Thank you for again sharing a wonderful thoughtful post with us! I have been blessed beyond measure with an amazing Father myself and also an amazing Dad to my children. I realize how lucky I am. My husband was not as lucky. He had not spoken to his Father in years after being rejected so many times. He had no example growing up of what a Father should be like. My heart breaks for him. I am thankful he has taken that experience and tried to be the best that he can be. My cousin was the result of a one or two night stand and her mother left when she was 4 so she was adopted by her grandfather. Grandmother left a few months before that. She use to think her mother and father were married and he left because he didn’t want her. She’d cry because her mom wasn’t a good mom. I’d tell her that her mom was the best mom she knew how to be. When she’d get all sad because she wanted a real mom and dad and tell me I was just like a mom without the dad I’d ask her what a is and what he does then point out that she has a Father in heaven that is all those things and he’ll never leave her. Happy to say she’s now a beautiful 22 year old but still has some relationship issues. Great post! Your words, ‘You can’t give away something that you do not have” were just what I needed to hear! Thank you! My heart opened just a crack , so now there is hope! Thanks for posting this. I can’t even imagine how hard it was to type that. I lost my dad 3 years ago and it still hurts to think about it. I pray that you will have comfort. Sadly, I think that this is probably a story that lots of people share. I have neices and nephews who aren’t being raised with their fathers and I worry for them. I’m so happy that you came to the knowledge that God is your father 🙂 And here is a huge hug from Colorado. I wish I could go through and like these comments. Wonderful to see how God can make good come from what we perceive as evil (and truly is, much of the time). Praying he comes to know the love of The Father, too!! And look how many you have helped by following God’s lead in your own life, too. I appreciate your example of Christ-like behavior. Truly. Thank you! Your story made me cry. We NEVER know what other people have gone through, to make them the people they are today. I am so happy to know that you have the Love of the Father to make your life complete. My story is very similar except it was my mother that left & I never knew her until I was about 42 and only then because I searched for her & found her. Like you I am glad I got the chance to meet her & was mature enough to realize there are always reasons why these things happen & I was able to let her know I forgave her & was quite thankful she left us instead of taking us with her. God does know best! Thanks for sharing your story with me, it’s comforting to hear others that have gone through similar situations as well. Thanks and hugs to you as well!